I had a question. Have you ever heard of the term Narrative Archetype? What does it mean to you in theory and to all of us who use your products "Dramatica" and last but not least, Could you tell me a little bit more about your new software "StoryWeaver" and how it can benefit me and make life a little easier for me as a storyteller? Although I've heard the term Narrative Archetype somewhere or other, I honestly have no idea what it means! I can tell you that in Dramatica theory, the narrator is seen as the author speaking, even if the author also appears as a character in the story. So, when one player dies and another player picks up his or her dramatic functions, that new player may actually be the same character. Now, getting back to the narrator, in Glass Menagerie, Tennessee Williams has written himself as a character in this loosely autobiographical piece. But, from time to time, he steps toward the audience and addresses them directly. Then, he returns into the stage to continue as if he was unaware of the audience. This is the player as character, then dropping that role to adopt the role of narrator and then returning the role of character. Basically, it’s the same "person," but with different functions. In comedy, you'll often see a player do an "aside" to the audience - a look directly through the "fourth wall" of the stage or into the camera that breaks the fiction. It forms an author's commentary on the action that is clearly meant to indicate that at that moment the player is speaking to the audience directly and therefore carrying the author's message. A great example of this is in the old series Northern Exposure. There is an episode where two major characters are about to fight a duel. The series lead, Joel, tells them to wait. He then launches into a discussion about the script and it's implications. One of the other characters, Maggie, says that he can't to that: he can't just step out of the story and discuss the script in front of the audience. He goes on to argue that they are doing this whole thing for the audience and are obligated to make it come out right. So, then enter an "impromptu" story conference until they all decide to skip the duel scene since they can't figure out how to make it work out without a tragedy and go directly to the scene at the end where both parties survived and everyone are friends again. Now what is particularly interesting about this is that they stay "in character" while stepping out of character! In other words, their personalities, attitudes, and approaches remain consistent while arguing about the script, even though they have all become narrators! Which brings me to your second question about StoryWeaver, the new software program I've created specifically to deal with the passionate side of storytelling. As co-creator of Dramatica, my purpose was to define structure absolutely, so we could all know what pieces we had to work with, and how they could fit together to create different combinations that were always sound drama. But there was something lacking - the heart and soul of storytelling! And that's where StoryWeaver comes in. Since Dramatica was first released in 1994, I've struggled to devise a passionate approach to story creation that was both consistent with Dramatica's structural view, but focused on the heart line, not the head line. StoryWeaver is the first release of the result of that work. By listening to the students in my UCLA course in Dramatica theory, by getting back in touch with my own roots and reasons for writing, and by answering email like this, I've come "full spiral" back to the joy of writing, but carrying a bag of structural tricks. And that's what I'm sharing in StoryWeaver. 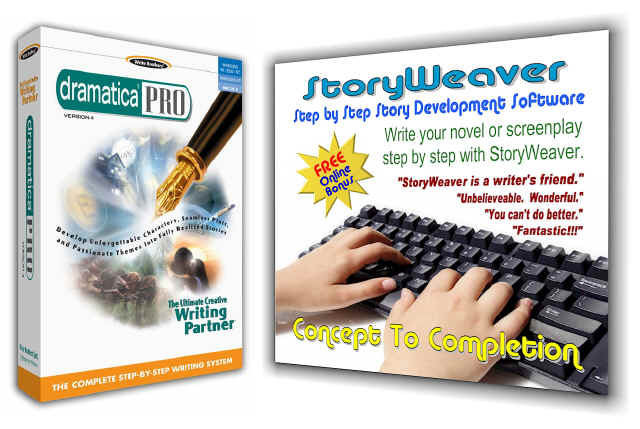 StoryWeaver is a step-by-step approach to working out the details of what your story is about and how it unfolds. But, it doesn't mention structure at all. Rather, the structural side is hidden behind the questions, not right up front where you would have to turn away from your muse to figure something out. There are four stages in StoryWeaver - Inspiration (where you come up with ideas for your Plot, Characters, Theme, and Genre to supplement what you already have in mind), Development (where you add detail, depth, and richness to you ideas), Exposition (where you work out how these ideas will actually show up in your story), and Storytelling (where you develop a timeline as to how these ideas will be revealed to your reader or audience as the story unfolds). By the time you get through all the questions (about 150 of them! ), you'll have devised a complete, detailed, sequential treatment of your story, ready to write OR to take to Dramatica for further structural development. You can't import directly to Dramatica (at least not yet!) but if you work out your story passionately in StoryWeaver first and THEN approach Dramatica, you'll have created so many interesting characters and so much involving action that Dramatica won't dry up the muse.